As you can see from the interactive chart below, more HBS MBA graduates are heading out to the West Coast, taking positions in product management, marketing, sales, and general management. In a dramatic shift versus a decade ago, technology jobs are just as sought as roles in finance. MBA’s are proving that they can make a difference as leaders in many different industries and fields. Classes, such as Launching Technology Ventures and Product Management 101, are encouraging this trend – preparing students for these jobs. HBS teaches us that we can’t have everything. From day one, we are inundated with endless mixers, social gatherings, and recruiting events. We are also exposed to hundreds of classmates who each have an incredible story to tell and would be incredible additions to our network. However, we can’t pretend to really get to know them all, just like we can’t prepare well for every single interview. We have to make tough decisions. We have to invest – fully and deeply – in the few people and things that make us the happiest. Only then can we make a truly meaningful impact as future business leaders. No one is perfect, regardless of how impressive their resume. Everyone can improve if they put effort in and use their friends and peers in the process. After a semester of cases and guest lectures one theme became clear: success post business school depends less on your IQ and more on your ability to work with others. Can you motivate a team and accomplish a common task that is impossible to achieve alone? We would say no if you cannot accept and give the honest feedback that allows a team to function at an optimal level. As uncomfortable as it is to give and receive feedback, the MBA class contains people who have a vested interest in your success and want to see you “Be all that you can be”. Seeking out these people and letting them play a direct role in your development creates the potential for amazing growth. Focus on your strategy, on your goals, and on what you are uniquely good at and love. The rest is noise. If you are terrible at modeling financials or hate using Excel, learn the basic competency, and then follow your passions. There will be something that makes your eyes sparkle and your face light up. Find out what that is – you have two years to do just that – and then run after it without looking back. To Ajmal Sheikh, Heidi Kim, Julia Yoo and Walter Haas: You have each been wonderful co-authors and co-editors in this writing process and more importantly dear friends, thanks for making an idea become reality. 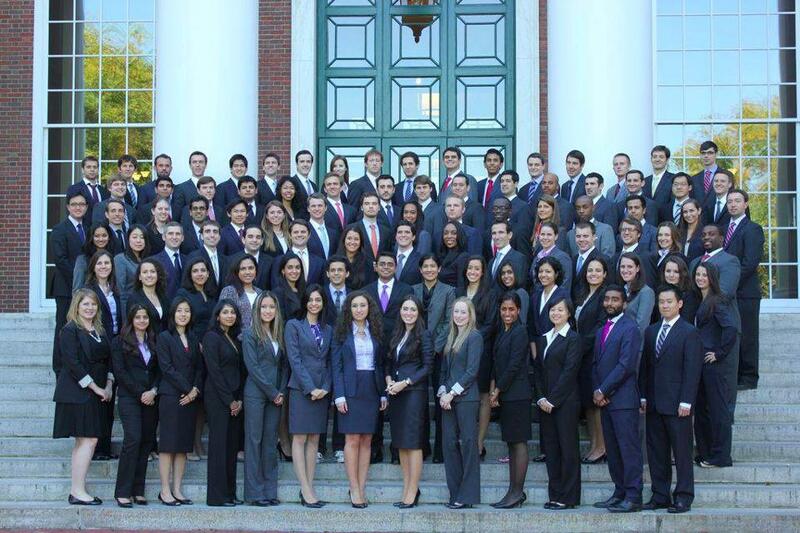 To the Professors, staff, and faculty of Harvard Business School, thanks for making this an experience unlike any other – one chapter ends, the pages turn, and another begins! But one panel stood out for me yesterday, and not just because I was on it: "Women in VC". 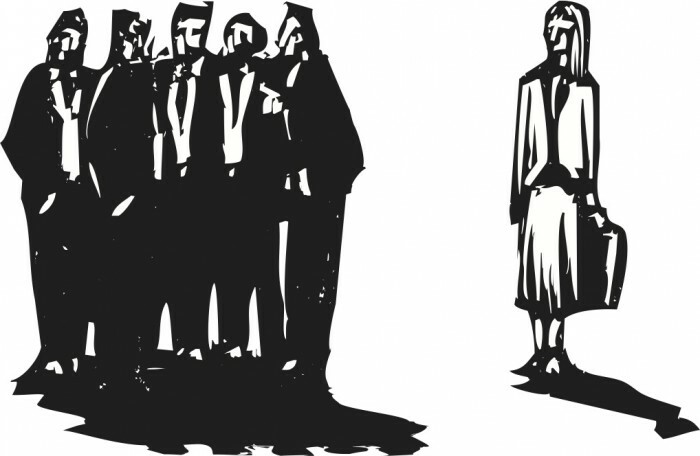 Maria Cirino of 406 Ventures led a discussion regarding the stubborn reality of the massive, pernicious gender gap that exists in our industry. Because the numbers are so stunningly bad – Dan Primack did some analysis a few months ago that showed that only 4% of all senior VC partners are women and NVCA statistics show that 11% of all VC professionals are women – I wanted to spend some time sharing the observations and discussions that came out of the panel in the hopes that it will spur further discussion in the community. The panel was an awesome group led by Maria and included Kate Mitchell of Scale Ventures, Diana Frazier of FLAG, author Vivek Wadhwa and Veracode CEO Bob Brennan. I don't know exactly why I was on the panel, to be honest, but it probably had something to do with a blog post I wrote four years ago titled "The VC Gender Gap: Are VCs Sexist"? It may also be that at Flybridge, after founding the firm with all men, we have hired a majority of women (5 out of 9 investment professional team members). That said, the four general partners are still men – more on that shortly. In an HBS research study, it was shown that – all else being equal - investors prefer backing men over women (and good-looking men over less good-looking men): a male founder is 60% liklier to secure financing from investors. Newsweek's cover story this week is titled "Women entrepreneurs fight for their piece of the pie" and shares some of the posts going around on Secret that depict the bad behavior of VCs in pitch meetings with women. A data point I didn't get a chance to mention during the panel is that only 9% of all HBS case study protagonists are women – something the dean has identified as an issue and has stated a public goal of getting to 20% (I have consciously tried to address this in my entrepreneurship class, where 40% of the protagonists are women and more than half of the panelists I bring in). The industry is a pattern-recognition industry, and – as Vivek points out in a WSJ article he wrote – pattern recognition can become code for sexism. One women VC I interviewed in advance of the panel shared with me that "Whether we like it or not, females act and are different than males, and I believe that lack of pattern recognition makes it harder to push through. So, partnerships need to make a conscious effort to not jump to conclusions when a colleague does something different – rather push themselves to look at results, not merely the path." Entrepreneur-turned-VC Heidi Roizen wrote a scathing blog post about her own experience last week that touched on this theme called "It's Different for Girls". It may be easy to dismiss Heidi's stories as what happened in the past, but in talking to my women colleagues at Flybridge, I hear similar stories, including senior VC men using their power status as a tool to hit on younger VC women. This puts the woman in a no win situation. On the one hand, these interactions can represent legitimate networking opportunities to build relationships across firms with potential mentors. But on the other hand, these interactions might put them in an awkward situation and further damage their reputation if and when it is clear that the meeting is not purely professional in nature. I raised the question whether we needed an explicit, organized Affirmative Action program in the industry, modeled after what elite universities have successfully executed on to ensure diversity and gender balance in schools. I have floated this around to a few other women VCs in recent weeks and get mixed feedback. Some have said it is absolutely necessary and would bring great focus and attention on the issue, forcing different conversations when sourcing and hiring VC professional talent. One woman VC friend pointed out that a big part of being a VC is confidence – confidence in your investment judgment, in the board room, in the partners meeting – and that women already have "Imposter Syndrome" and can lack that confidence. Having an explicit Affirmative Action program might serve to only further undermine their confidence in the business. (today’s blog post was co-authored with my partner, Matt Witheiler, with contributions from our colleague, Caitlin Strandberg). When we make an investment decision at Flybridge, it is typically because of the intersection of two forces: (1) a top-down thesis about a compelling market opportunity; and (2) a bottoms-up discovery of a compelling team that is pursuing something that rhymes with our top-down thesis. We are not unique here, but we try to apply a fair amount of rigor to the process so that when we interact with entrepreneurs in our target market sectors, we can demonstrate to them that we understand their businesses and have insight into the opportunities they’re pursuing. Last week, we closed a new investment in an online education company, our second new investment in this space in a month. Since these investments were the result of a few years of analyzing the market and working with a few other portfolio companies in online education, we decided we would “open source” our thinking in the spirit of “hacking education.” Or perhaps more appropriately, “fracking education” in order to shake it up to release the energy needed to transform this ossified system. Many others have observed that the $1 trillion education market is undergoing massive disruption. Paying $500,000 for a four year college experience that does not prepare students for the job market is no longer a winning proposition. Most K-12 schools are stuck in a silo mentality, implementing a rote learning model on a schedule that was designed for an agrarian society. And flaws in vocational training and workforce development have led to a massive jobs mismatch – there are millions of unemployed yet also millions of unfilled, open jobs. Many exciting initiatives are being created by entrepreneurs to address these issues – Khan Academy and EdX stand out in particular – but we are still very early in the process of the education revolution. All the energy and enthusiasm for ed tech is translating into dollars. 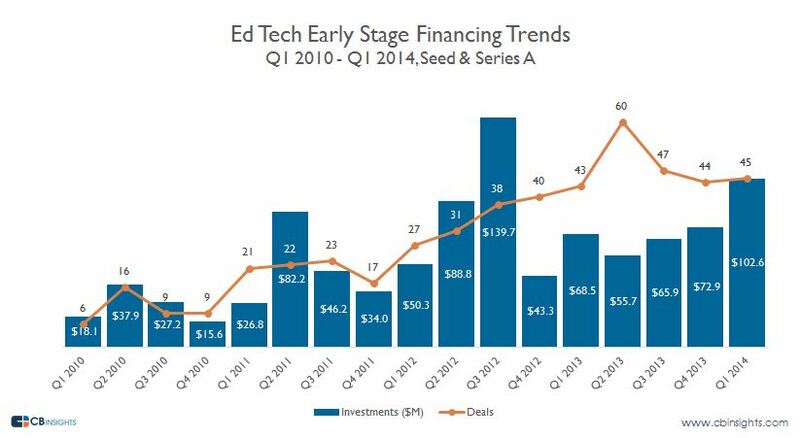 CB Insights recently reported that early stage edtech investing has grown substantially from a few years ago. As an investor, you never like to see a sector get overfunded. But this one is so large, and has so much room for further disruption, that we feel as if there still remain many exciting new opportunities. Jeff’s first foray in the education space was as an entrepreneur cofounding Upromise, a company dedicated to helping millions of families save money for college. At Upromise, Jeff saw firsthand how the spiraling cost of college was harming the middle class. Our investment in SimpleTuition (aka ValoreBooks) in 2006 was a derivation of this insight – to help millions of students engage in ways to save money by accessing less expensive textbooks and loans. The company now works with over half of all college students in America and growing rapidly. In 2010, we invested in Open English, a direct to consumer online English language learning service targeting the growing middle class of Latin and South America. The company has built an enduring brand in the region and serves tens of thousands of students, providing access to a rigorous academic program and live instruction all from the comfort of home. In the last few years, hundreds of entrepreneurs and startups have emerged to create companies to take advantage of all cracks and fissures in the market. As part of our analysis of the space, we systematically mapped the sector (tracking 100’s of startups) and created a hierarchy to help categorize the various facets of the industry and hone in on what areas we find most exciting. 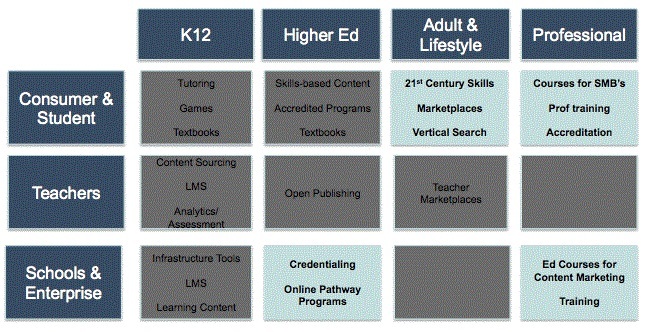 We found we could categorize various companies in the broader edtech theme based on two dimensions: who the customers are (consumers/students, teachers or schools/enterprises) and what age segment they sell into (K12, higher ed, adult + lifestyle and professional). In each cell you will see examples of the types of companies that fit the segment – these are broken out in much more detail with extensive competitive mapping in the Prezi. You will notice that four of the cells above are shaded light blue. This wasn’t by accident: these are the areas that we, at Flybridge, believe represent interesting investment opportunities. That’s not to say great companies won’t be built in the grey-shaded cells, it’s just that, in our analysis, these sectors tend to be more difficult or more played out than those in the blue. This thesis and map is not intended to be the be-all-end-all of edtech investing. Part of our goal in publishing this is to solicit feedback and help further refine our view of the landscape – something that we, as investors, must constantly do. We welcome feedback, thoughts and criticism of all sorts. Most important, let’s figure out a way to hack – and frack – this broken system.